Shave, trim & style. All in one. with adjustable comb and charging stand. Does everything to make you look good. 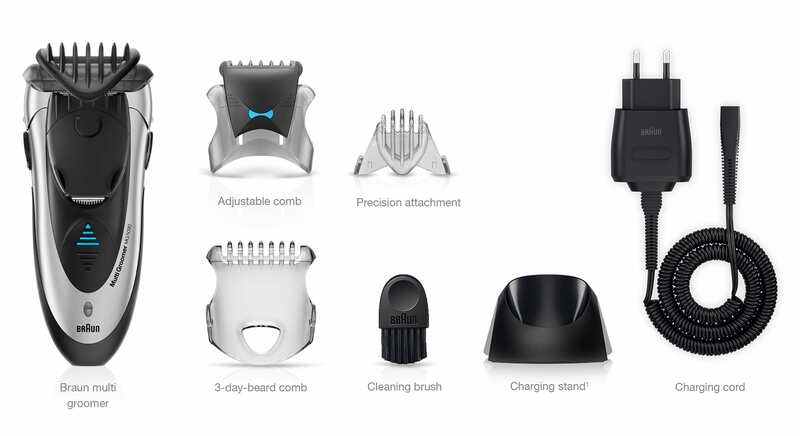 Adjustable Click&Lock comb for precise beard styling and easy handling. Twistable Dual Trimmer with wide side for efficient trimming and narrow side for precise contours. Extra wide shaver head with SmartFoil for an efficient and smooth shave where you want it. Click&Lock comb for precise styling. Simply adjust the Click&Lock comb to trim hair to 4 exact lengths (1.2mm, 2.8mm, 4.4mm, 6mm). All you need, always precise. The 1.2mm comb is especially designed to give you this 3-day-beard look. Twist and style your contours. The twistable trimmer with a narrow and a wide side gives you precise control over your beard contours. Define lines and edges, no matter how detailed they are. The extra wide shaver head is equipped with a flexible SmartFoil, for a smooth and clean shave in only few strokes. Dual battery for powerful performance. For consistent results even in tough conditions, the dual battery system keeps trimming power constant. A full charge takes only 1 hour and gives you 30 min of cordless performance. A 5 minutes quick charge is already enough for 1 trim. Use in the shower for convenience. Rinse with running water for easy cleaning (certified to IPX7 standard). An LED light informs about charging status. The Braun multi groomer automatically adapts to any voltage between 100V and 240V. It works in practically every country on this planet. The charging stand is convenient and keeps the Braun multi groomer always ready.